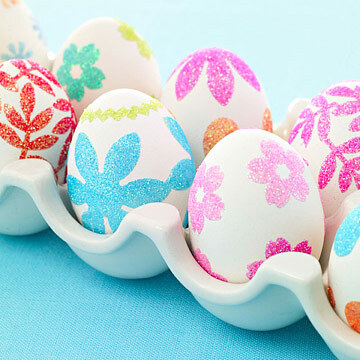 We hatched a few simple egg decorating ideas, no messy dyes needed. Plus, brighten your home with a cheerful floral wreath. 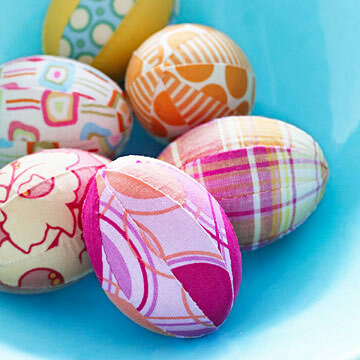 Cover eggs in fabric pieces for a pretty patchwork effect. Here's how: Choose a selection of brightly patterned fabrics, either new or remnants. Peel off one paper layer from a double-sided adhesive sheet and attach the sticky side to the back of fabric. Smooth and press out any air bubbles. Print template onto thick paper (like card stock) and trace onto the paper-backed side of fabric. Cut out fabric shape and remove the paper backing. Apply the sticky side of the fabric to the egg, pressing down the edges with your fingers. Use as many fabric shapes as needed to cover egg. (We used eight for each egg). For a uniform look, use the same fabric—or play with complementary patterns and colors. A craft punch gives eggs some fanciful fretwork. Here's how: Tear off a strip of 1/2-inch-wide washi tape that is roughly the same length as the egg from end to end. (Japanese washi tape is a fabric-like masking tape that comes in dozens of patterns, colors, and widths.) Lightly affix tape across the edge of a sheet of vellum paper. Using a decorative edge craft punch, cut designs onto the tape. Carefully remove the tape from the vellum. Repeat the technique with a second strip of tape. Line up both pieces on the egg with the straight edges together as shown. Gently affix tape pieces to the egg, pressing out any air bubbles. To make the solid stripe, use washi tape that is 1/4 inch wide. Wrap the tape lengthwise around the egg and cut to fit. Rub tape down to push out any air bubbles. Repeat both designs as desired. 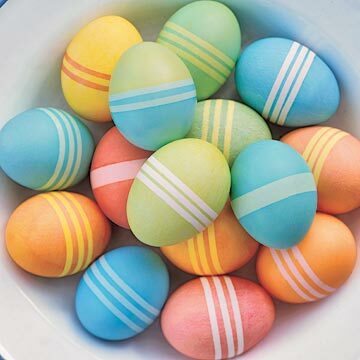 (Our egg has four solid stripes and four craft punched stripes). A cheerful faux floral wreath brings a touch of spring to a window or table. Here's how: Apply a dab of craft glue to the back of a paper flower (available in the scrapbooking section of a craft store). 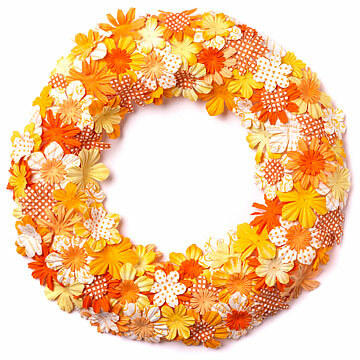 Attach flower to a 12-inch Styrofoam wreath form with semi-rounded edges and hold in place a few seconds to dry. Repeat until the wreath is covered with flowers. Use flowers in just one color or mix and match as shown. Lay flat on a table for a centerpiece or hang on a wall or window with a ribbon. Opt for a chic lineup this year with vibrant bands of color. Here's how: To create bands, wrap 1/8-inch-wide double-sided adhesive tape lengthwise around egg and cut to fit—about six to nine strips per egg. Press firmly. Pour fine glitter into a paper coffee filter or bowl, one per color. Working with the darkest colored glitter first, remove paper backing from a tape strip and roll the egg in glitter, pressing down to adhere as much as possible. Repeat for each color desired, using the lightest shade last. Glitter instantly sticks well to tape so don't worry about getting colors in the wrong places. 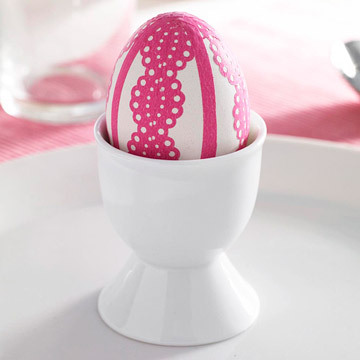 Remove excess glitter by brushing the egg with a soft, clean paintbrush. Celebrate spring with mod floral decals in dazzling iridescent hues. Here's how: To make stickers, use a craft punch to create shapes from double-sided adhesive sheets or cut freehand using scissors. Remove backing from one side of the sticker and apply it to the egg. Repeat shapes to create the design you'd like. Decorate with glitter following the instructions for the striped egg. 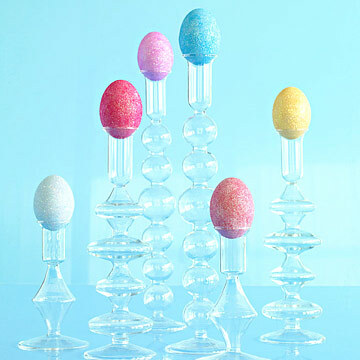 For high-wattage glamour, cover eggs in shimmering colors and display atop a collection of candlesticks—glass, ceramic, or whatever you fancy. Here's how: With a damp sponge, coat egg with white glue. 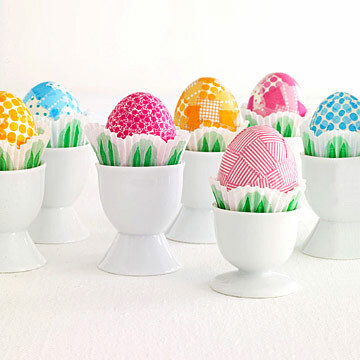 Pour fine glitter into a paper coffee filter or bowl and carefully roll the egg in it. Spoon glitter over any exposed spots. Let the egg sit in the glitter for a few minutes until it's dry. 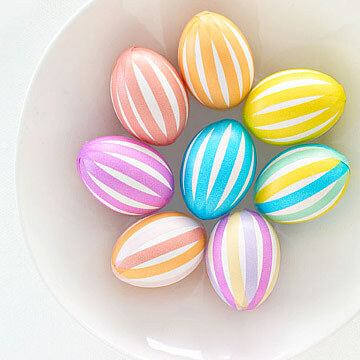 Try decorating your eggs with bold stripes made from washi tape. Here's how: Select washi tape that is approximately 1/4 inch wide. 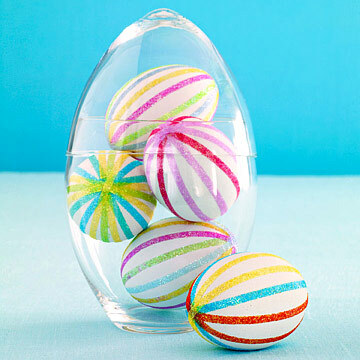 Wrap the tape lengthwise around the egg and cut to fit, creating 12 stripes. Rub tape down to push out any air bubbles. Use the same color tape for stripes or alternate complementary hues. Create colorful collages by layering washi tape. Here's how: Use washi tape that is at least 1/2 inch wide. Create a collage of patterns by tearing small pieces of any length and covering egg. Press out any air bubbles before attaching next piece of tape. For the best effect, vary the placement of the tape. Repeat the same color and pattern to create an overall design or mix and match patterns for a patchwork effect.